Which happens to mean it’s a lot less exciting than Star Trek-style transporting, unfortunately. But it’s still really cool, I promise! This “quantum teleportation” doesn’t actually involve teleporting a real object—it’s not really teleportation at all. The scientists are actually sending information about a particle of light in a way that can only be accessed by two observers. This could have major implications for the future of computing—it would make for incredible data encryption. But encryption with this technology is still pretty far off. 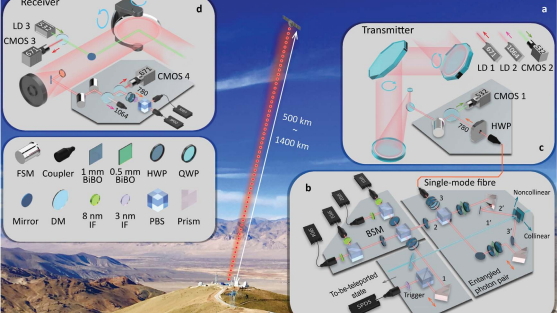 Still, the researchers write in their new paper, “This work establishes the first ground-to-satellite up-link for faithful and ultra-long-distance quantum teleportation, an essential step toward global-scale quantum internet.” Let’s walk through what that means. Last summer, China launched a satellite, called Micius, designed to test communications based on the principles of quantum mechanics over large distances. They released their first results last month, demonstrating that they could “entangle” particles over record distances—hundreds of kilometres. Entanglement is a consequence of the fact that in quantum physics, the scientific theory governing the smallest particles, humans can’t determine photons’ exact properties until they look at them. Before we make an observation of a particle, we only probabilities describing what the particle might look like. I’m just going to steal an analogy I used the other day, where photons are balls, and their colours (red or green) are analogous to their properties. As an example, let’s say there are two bags, and each has one of two balls, red or green. You give a bag to your friend. Quantum mechanics only gives the probabilities that your bag contains either ball colour, and that’s all you know before making the observation. At human scales, each bag already contains a red or green ball. Quantum mechanics says both balls are red and green at the same time—until you look. That’s weird on its own, but it gets worse. If you look at your ball, the other ball automatically takes on the other colour. What the Chinese satellite did was use lasers and crystals to bestow light particles with one of two available properties, in this case, polarisation states, entangle them, and separate them between 500 and 1400 kilometres, or 310 to 870 miles. Essentially, they prepared the two bags with the red/green balls. Once the researchers have these particles entangled over a distance, they can take advantage of their link to send secrets between the bag holders, which is what their new paper, posted on the arXiv physics preprint server, claims to have done. So, here’s a simplified version of quantum teleportation. Let’s say you take a red and a green ball, put them randomly into one of two bags, and hand one to a person on the ground, and another to a person at the satellite. But on the ground, there’s a second bag, containing another green ball that the folks on the ground want to “teleport” to the satellite, without anyone else knowing it was green. Quantum teleportation says that, with the entangled link already set up, the folks on the ground have only to open both of their bags, then call the satellite on the phone and say either “same” or “different.” If the ground observer opens both bags and sees both balls are green, she can just say “same” to the satellite. The satellite will then open his entangled bag, which has to have a red ball, which means the ground must have had the green ball in the entangled bag, and that means the secret ball had to be green. Thus, the state of the secret ball is “teleported” to the satellite. This is an oversimplification, but gets to the main point, that only the information, and not the particle itself, is teleported, without actually having to tell anyone what’s in the secret bag. And it still requires some non-quantum communication—the exchanging of a secret one-time key. Scientists have done this sort of “teleportation” before over fibre optic cables, but this is the furthest distance and the first time it’s been done from the ground to a satellite, rather than between places on Earth. Matthew Leifer, physicist from Chapman University who helped me with the ball analogy, didn’t feel comfortable speaking to the specifics of the experiment as a theoretical physicist, but said: “If your goal is to create some kind of quantum cryptography network, then using a [quantum satellite] to do it would be a significant step forward.” That is, if you wanted to send encrypted data over a satellite network like this, and if what the team says they’ve done is correct, then it would be a significant advance. Leifer pointed out that that the fidelity—the quality of the received signal—was not as high as in ground-based experiments. And, for the millions of photons sent, the researchers only confirmed their results in 911 cases. according to an MIT Technology Review story on the paper. On top of that, the paper hasn’t been peer-reviewed by other scientists, so it’s important not to take its conclusions with a little caution, in case something changes when a journal publishes the final manuscript.